They say that all you need is love, but we say that all you need is food (if you have access to both, congratulations, but some of us are relying strongly on food). This week is full of Valentine’s and Galentine’s goods, the opening of a food truck Mecca, and homemade gnocchi by the bowlful. We. Are. Ready. Ah yes, Valentine’s Day is upon us. Whether you’re seeking a romantic getaway, the ultimate date, or you’re brutally single and ready for cocktails (because Pringles just won’t cut it today), we’ve got all the last minute suggestions you need. Happy Hallmark holiday. These guys are definitely going to grow sick of hearing ‘Louise’ thrown about the joint. Jeez Burgers is another fine addition to the world of loaded buns, with a very affordable and delicious menu, complete with the likes of chicken wings and Oreo milkshakes (screaming)! This little bitty has rebranded with a gastropub focus! The food you know and love has taken on new casual twists, including the likes of ricotta gnocchi with baby peas, pecorino, poached egg and butter and sage sauce, as well as soft veggie tacos with cactus and ancho salsa and salted ricotta. There’s also sweet daily specials Monday thru Saturday. We just felt a spark! King Street’s own food truck Mecca is set to open on February 14! We’re talking a rotation of booze, cronuts, burgers, pizza, and basically everything else that’s worth living for in one handy dandy location. The ultimate foodie playground is going to slay! Lunch is great; who doesn’t love an excuse to eat AND stop work simultaneously? Jamie’s Italian is taking your fave thing since sliced bread up a notch, by introducing Super Lunch. Three quick and affordable options are available with one for $20, or you could try your hand at two courses for $25, heck even three for $35. Get in from Monday to Friday between 12-5pm and satisfy that office hunger. Don’t be sad, it’s Carnival! The Cuban is celebrating this colourful festival every Friday night during February with dancers, performers and a themed banquet. The banquet features spicy sweet pork belly with apricot and chilli, and rosemary and thyme mushrooms with crumbed goats cheese that will leave you doing a cheeky samba into the night. 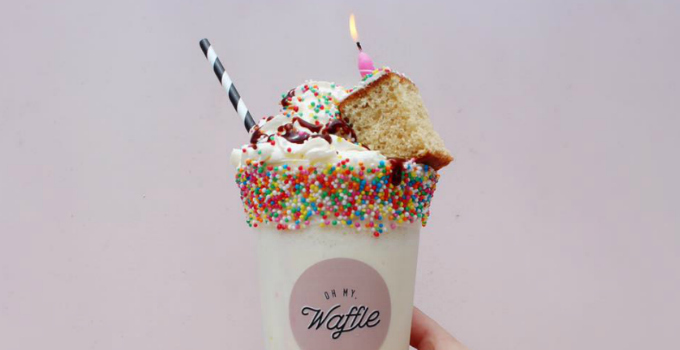 Oh My Waffle is now open for all your next level breakfast, lunch and dinner needs (because waffles are an all day food, clearly). You can also have your cake and drink it too with some seriously loaded shakes! We like this all a waffle lot. Vegans rejoice! A plant based market place is hitting up Miami by April, including the likes of Gigi Pizzeria, Moo Free Burgers and Flour of Life, plus HEAPS more. What a time to be alive. Your homemade food away from home can be found at Little Paul’s! This ever-changing menu will contain hearty, home style dishes such as lasagne, fresh paninis and parmigiana sliders. You can also take home imported Italian goods if you want to try your hand at cooking. Bellissimo. Learn to drink like Don Draper at Dutch Courage this February 17! The Mad Men Redux Cocktail Masterclass will be one for the seasoned drinker, with strong cocktails and how to how to craft perfection. You’ll be starting with a classic Italian negroni, followed by a Manhattan, followed by an Uber ride home. Get back to student basics with Brighty Thursdays! The Brightside is launching a student friendly night from February 22, with Dadbod Futsal, DJ’s and friendly drink prices all night long. Find out more here. Gnocc, gnocc, we’re so there. Ristorante La Famiglia is launching Gnocchi Tuesdays tonight! Every Tuesday, you’ll be able to savour fresh, hand rolled little pillows of happiness, with a selection of flavours and gluten free options available. Delish! Words by Nicole Portacha – the gourmand who knows true love is the perfect burger.